Bacchus has long been one of Brisbane's best and most awarded restaurants. With the recent appointment of new Head Chef, Massimo Speroni (previously sous chef at the 2 Michelin-starred San Domenico in Imola, Italy) and the introduction of a new menu we were keen to see if Bacchus lives up to its reputation as Brisbane's go-to option for special occasion dining. And indeed, it does, with layer upon layer of flavours, textures, atmosphere, service and culinary theatre, blended expertly to create the ultimate dining experience. 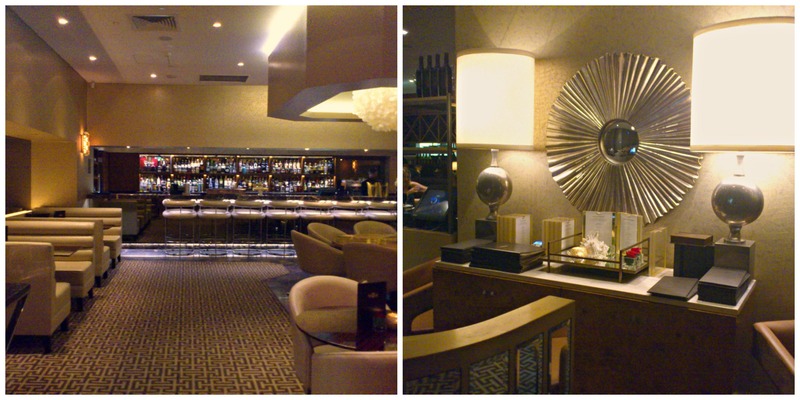 Ensconced at Rydges, South Bank, Bacchus exudes understated elegance and quality. Soft carpets, subdued mixed lighting, metallic accents, subtly patterned wallpaper and leather chairs all contribute to the cosy, private club atmosphere. My high-backed leather chair was not just a stylish statement decor piece, it was very comfortable, and the large table provided plenty of room to spread out. Chef Speroni explained to us that the new menu is a mix of classic and modern options, with something fresh and tasty for all palates. It was a pleasure to pore over its leather-covered contents, each intriguing item worthy of consideration. It includes a Raw and Cured section for something a little different. Try beef tartare with quail egg, shallot, and lemon and mustard dressing ($30) or snapper carpaccio with cucumber, buffalo yoghurt and caviar ($29). Entrees include squid ink fish gnocchi with squash, pine nut and mint ($34) or pan-fried veal sweetbreads with salad, sumac, crunchy buckwheat and black truffle jus ($30). Main courses include grilled chicken breast with croquette, herb salad and tarragon jus ($42) or seared veal fillet with sunflower seeds, green cardamon and wood ear fungi ($49). 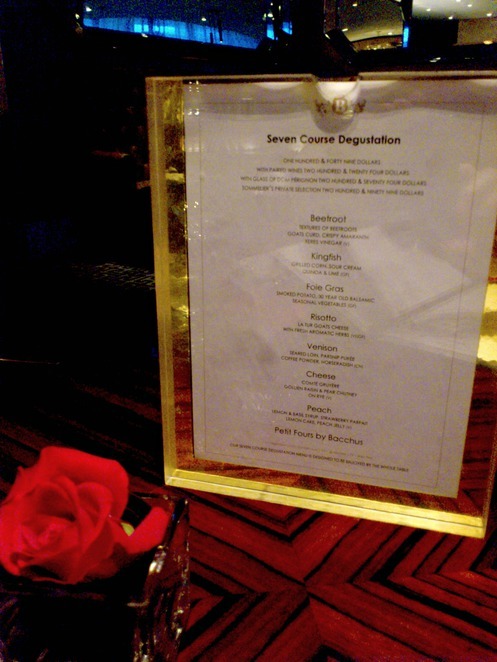 While all of this sounded delectable we opted for the seven-course degustation ($149, or $224 with paired wines) so we could sample as many delights as possible. And delights they were, even items that I would probably not have chosen from the a la carte menu. And therein is the secret of the success of degustations generally: If you're prepared to put yourself in the hands of the culinary experts you can have a dining experience that is not just sometimes out of your comfort zone, but is usually out of the box as well. Bacchus bar and reception area. The Bacchus degustation totally lived up to the promise of the menu. It was a procession of courses that tantalised the eye, nose and mouth, with first-rate attention to detail in the flavours, presentation and service. This was food as art and theatre, but not just the art and theatre of some 'molecular gastonomy' that seems to be more about looks and quirky inventiveness than flavour. This was food of substance AND style. We began with some delicious amuse-bouches (literally 'mouth amusers') and were then presented with our first degustation course - Textures of beetroot with goats curd, crispy amaranth and xeres vinegar. Who would have thought that such an old staple as beetroot could taste, and look, so good? 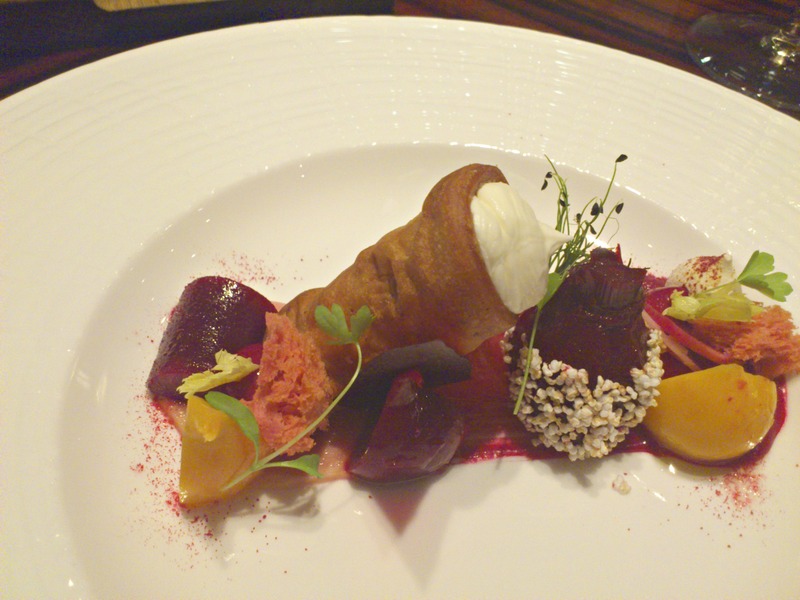 This was all about sweet, earthy beetroot in surprising ways, all balanced by the crunchy cannoli and creamy goat's curd. Our next course - Kingfish with grilled corn, sour cream, quinoa and lime - was a winning combination of perfectly-cooked, tender kingfish offset by layers of corn: lightly grilled kernels, sweet puree and popcorn - yes, popcorn, with a light pop of zingy lime. Next - Foie Gras with smoked potato, 30 year old balsamic and seasonal vegetables - was, I think, the pièce de résistance of the whole meal and a triumph of presentation and flavours. This course sat on a wide, white plate covered by a clear, smoke-filled dome. 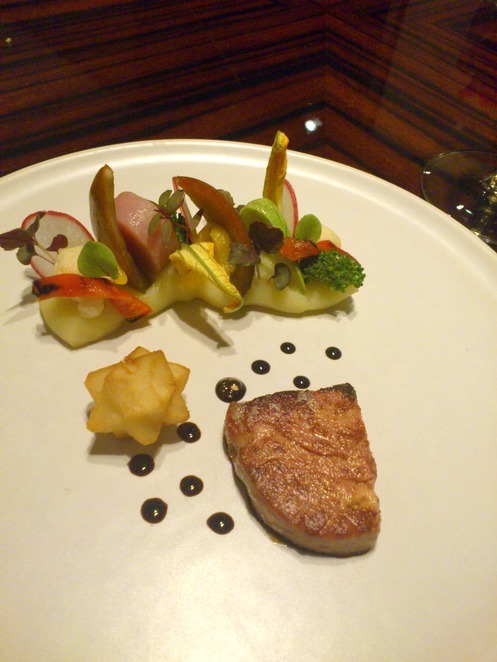 The dome was lifted and the smoke wafted away to reveal the delicately smooth foie gras and the vegetables that appeared as a garden on a plate. 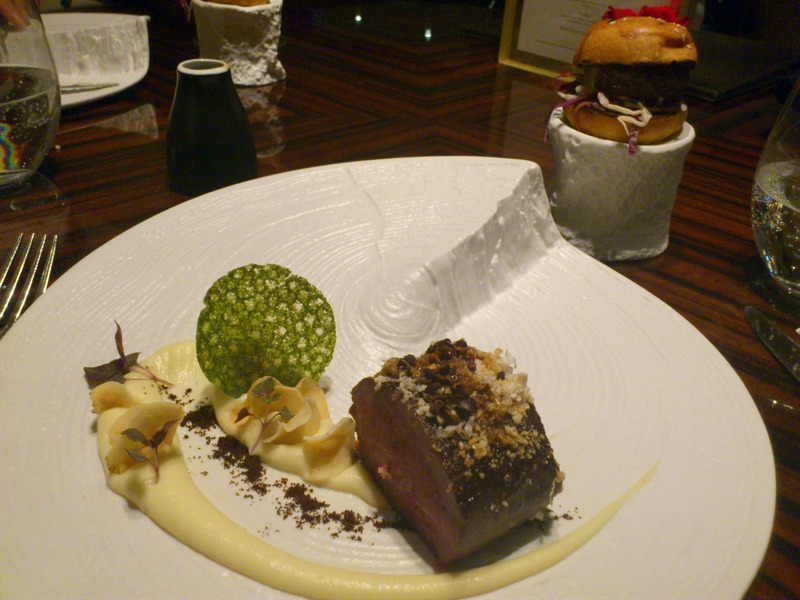 The combination of flavours and textures was wonderful, with a light, lingering smokiness evident in every bite. 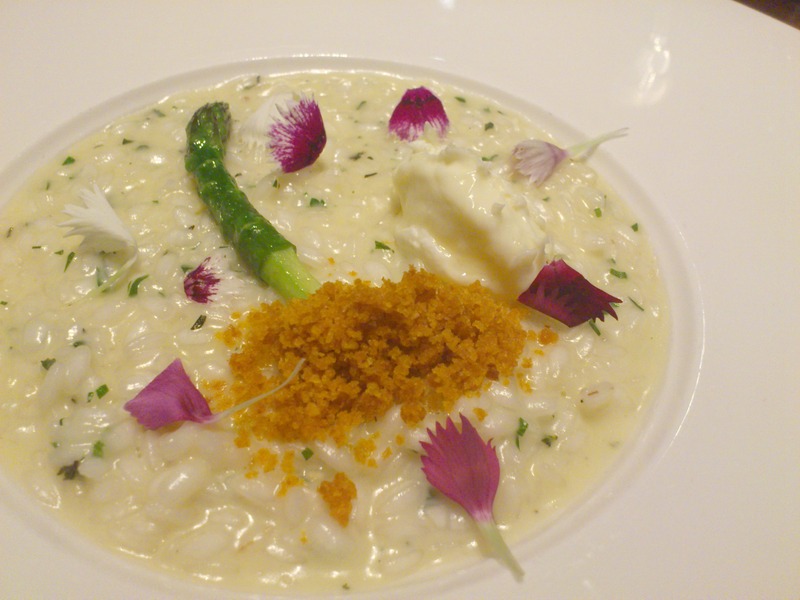 Risotto with La Tur goats cheese with fresh aromatic herbs was an elegantly simple dish with a perfect balance of creamy risotto and salty goats cheese. Our meat course - Seared venison loin with parsnip puree, coffee powder and horseradish - was served on an unusual plate created to look like the uneven top of a sawn tree stump. The venison was lean and flavoursome without being overpoweringly gamey, and was offset well by the sweet, velvety puree. The cheese course on the evening we visited was 24 month-aged cheddar with fig jam, lavash and rye bread. The cheese was much milder in taste than I expected and the peppery, crunchy lavash and sweet jam made this a tasty combination. Our dessert (I regret to say I quite forgot to take a picture of it) was lemon cake with lemon and basil syrup, strawberry parfait, peach and lemon confit. The strawberry and peach flavours were a nice foil to the dense lemon cake and basil and lemon is a perfect match in my book. On two occasions throughout the meal we also enjoyed refreshing palate cleansers; an orange and Campari granita, and a basil sorbet. By this stage, it was looking like I had made the correct decision to forego lunch that day. 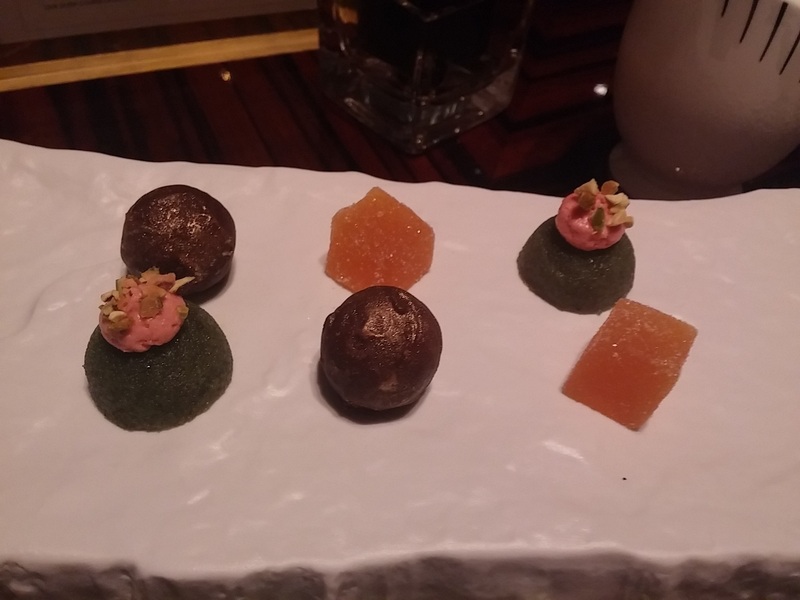 The meal was topped off by a pot of delightful Paris tea and a selection of scrumptious petit fours. Whew! Dinner at Bacchus really is the whole package. I just love quietly accomplished restaurant staff and Bacchus' staff are impeccable - knowledgeable, friendly and very good at what they do. Each course was explained to us as it was brought to the table and presented perfectly. I haven't mentioned the wine list. Bacchus' drinks menu has received many awards, and it isn't hard to see why. The weighty tome consists of 64 pages of everything you're likely to want to accompany your meal. Reds, whites, Australian, imported, champagnes, whisky, port, sherry... the list goes on. And you'll have fun perusing its contents or placing yourself in the hands of their expert sommelier. This is not every day dining and your wallet will recognise the difference, but more importantly, so will your taste buds and your whole appreciation of a first-class dining experience. 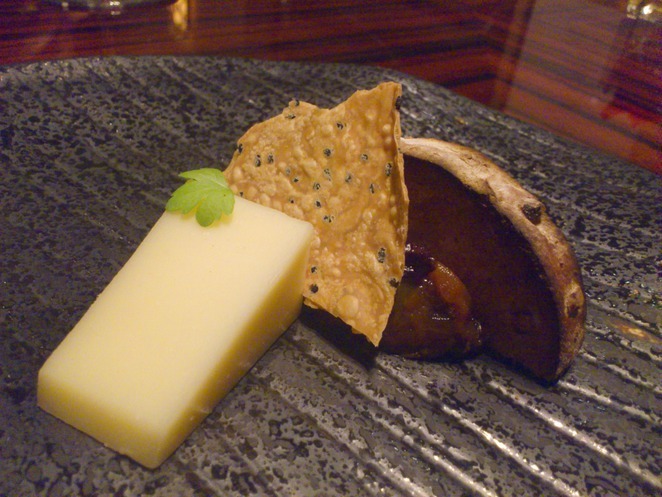 The degustation was a rare pleasure and something to relish for a special occasion. If you don't have a birthday, anniversary or engagement coming up then I suggest you elevate something more mundane to the status of a special occasion and then celebrate it. Any excuse will do. Your mother-in-law is away on a lengthy holiday? Celebrate at Bacchus. The dog has finally learned the new trick you've been working on? 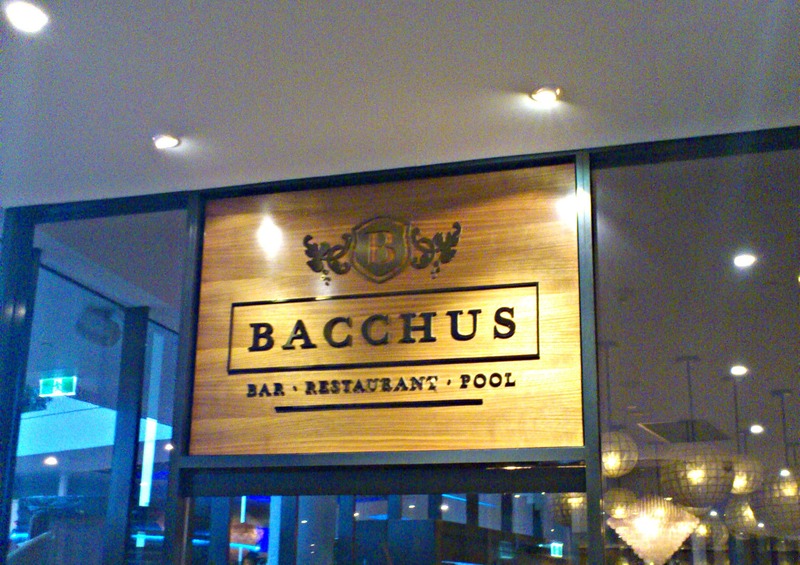 Bacchus. It's the weekend? Bacchus again. It really is that good. My thanks go to Chef Speroni and all the wonderful staff who made this such a memorable birthday experience. When: Dinner (Tuesday - Saturday) 5.30pm – 10:00pm. For other opening times see the website. Cost: Degustation $149 per person or $224 per person with paired wines.